A Melbourne-based mining company has been linked to death threats against Aboriginal elders in Western Australia. Hawthorn Resources carries substantial Chinese investment, has a six-person Board of Directors which includes three Chinese as well as infamous anti-worker die-hard Chris Corrigan who led Patrick Stevedores in its massive attack on the Maritime Union back in 1998. The company is currently in conflict with the Indigenous managers of Pinjin cattle station, 145 kilometres north-east of Kalgoorlie. Its open cut gold mine is just 150 metres from the Pinjin Station homestead where between 6 and 20 Aboriginal people live, depending on the time of the year. The station is Crown Land, leased to Indigenous company Tisala Pty Ltd and managed for Tisala by Wongatha elders Leo and Lawrence Thomas. Hawthorn has ridden roughshod over the Pinjin people since it began testing there more than three years ago. The WA Mines Department has had to instruct Hawthorn to remove its sample bags littering local roadsides, and to reduce dust and disturbance to Pinjin’s infrastructure. What it has not dealt with (“outside our scope”) is the racist attitudes of Hawthorn employees and the company’s disrespect for the Pinjin people. Matters came to a head late in June when Leo Thomas discovered racist signs, including death threats, on the walls of his homestead and on fences nearby. Signs accusing “black nigars” (their spelling) of holding up mining, and claiming to have the WA Mines Minister’s support for the company (“So eat our dust and put up with noise or piss off”) were bad enough. 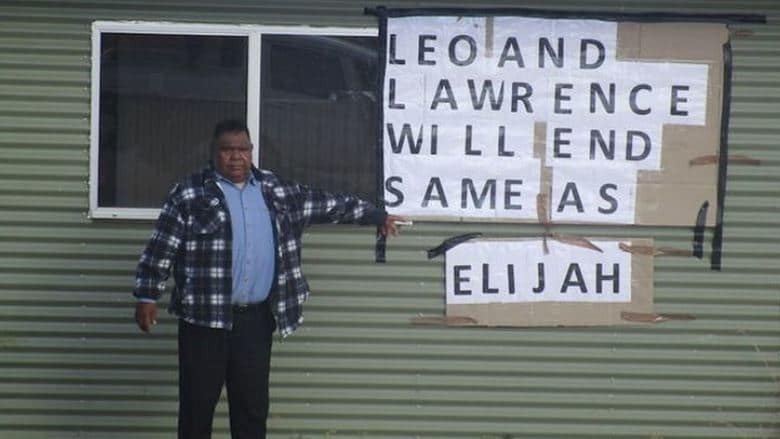 “We destroy black nigars” and “Leo and Lawrence will end same as Elijah” left no doubt as to the nature of the threats thrown at the Pinjin people. The “Elijah” reference was to Elijah Doughty, the 14-year old Kalgoorlie boy run down and killed in 2016 by a white fella subsequently acquitted of manslaughter. Hawthorn’s Chinese connection is to three state-owned and one private enterprise. In 2012 the company entered into an agreement with Feng Hua Mining Investment Holding Limited to secure $15 million in investments. Feng Hua is comprised of Chinese state-owned Guangdong Feng Hua Advanced Technology (Holding) Co. Ltd., Guangdong Rising Assets Management Co. Ltd, and Guangdong Corporation of Geology and Mineral. A non-state-owned entity, Lite Smooth Investment Limited completes the Feng Hua quartet. Given the exemplary attitude of China during Mao Zedong’s time towards combatting great Han chauvinism and protecting the interests of China’s minority nationalities, you would think that a company, half of whose Directors were from China, might have shown greater sensitivity towards relations with Australian First Nations peoples. But that was then, and this is now. Hence, the website of Hawthorn Resources makes no reference to Pinjin Station in its description of its mining activity there. It merely says its operation “is located 140 kilometres north-east of Kalgoorlie and is centred on the historic Anglo Saxon Mine.” Nor is there any reference to or condemnation of the racist attacks on the Pinjin people. On June 26, Hawthorn Resources stated to National Indigenous TV News “that a number of threatening and highly offensive signs have been placed on Crown Land immediately adjacent to its mining lease”, a statement that was itself highly offensive by ignoring that the so-called “Crown Land” was the homestead occupied by Leo Thomas. It said that as the matter was before the police, there would be “no further comment”. Two days later, following a public outcry, including an accusation by One Nation upper house MP Robin Scott that Hawthorn Resources was responsible for the racial taunting of Leo and Lawrence Thomas, a further comment was made, a belated condemnation of the signage and a disclaimer of any responsibility: "Hawthorn, its officers, its employees, its partners and contractors had no part in creating or erecting the posters and categorically deny any allegations of this nature." What other Australians would be expected to have mine blasting 150 metres from home? What other Australians would expect to have 40,000 tonnes of ore per month excavated and loaded onto trucks 150 metres from home? This is allowed to happen because the only people directly affected are Indigenous Australians. According to Leo Thomas, the WA State Labor government should be ashamed of itself. “The Mines department has allowed Hawthorn Resources to continually and on a growing scale destroy over the last seven months hundreds of thousands of dollars of equipment and infrastructure,” he told the Koori Mail. “While these pictures are disgusting and sickening, what is even more sickening is the Mines department, despite being given photographic evidence, has allowed Hawthorn Resources to breach tenement conditions relating to dust, surface water flow, uncapped drill holes and small bags left on the ground affecting the wider environment. Hawthorn Resources should immediately end its mining operations at Pinjin. There is no excuse for subjecting Australian people to the noise and dust of an operation 150 metres from their home. It must cooperate fully with police in determining authorship of signs made in its name that promote racial hatred and convey death threats. Its Board of Directors should assume full responsibility for the hostility shown by racist elements towards the Pinjin Station managers, and resign.